Since the last 30 day colouring challenge, I have been wanting to participate in this challenge. This is a fun challenge run by Kathy Raccosin. Her blog is called The Daily Marker. I love colouring too and my plan is to do colouring as many days possible during this time around. Watch her videos and you will pick up so many tips and tricks. Kathy’s videos are lovely and relaxing. After watching Kathy’s first two videos, I decided to do some colouring today. I am not completely well yet. My allergies restarted again. I have been sneezing like crazy, with watery eyes and headaches again. Don’t know what I am allergic to! Never before I have had these symptoms. Anyway, I decided I need to do something relaxing. Colouring is one way to relax. I wanted to do no line copic colouring but my eyes were not cooperating. Hence I went with lined copic colouring. The flowers I have used are from Hero Arts. The stamp set is called Tea Flowers. 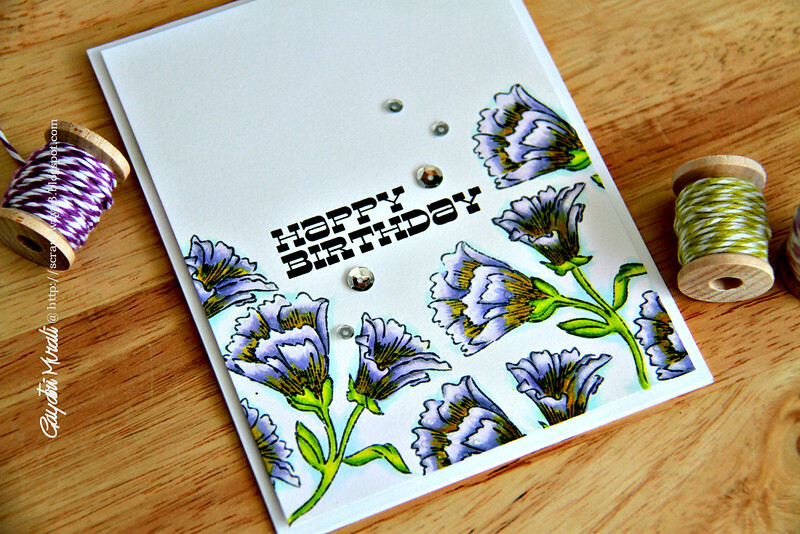 I stamped the flowers with Gray Flannel Momento Ink. Then copic coloured. I have used some brush stroke sweeping movements, blended two different colours, used 0 marker to add highlights. All of these are new to me. I am used to colouring and blending colours from the same colour family using round brush movements. I like the result here using a few new things I have learned from watching Kathy’s video. Thank you very much for the video because I am a visual learner. 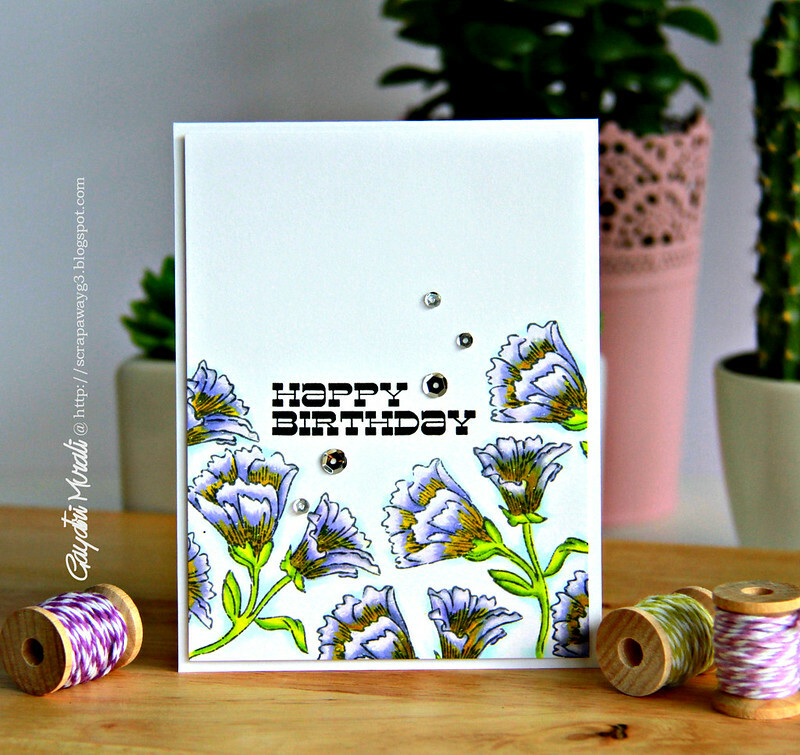 I stamped the sentiment from another Hero Arts set called Hey Day Sentiments. Then to the flowers, I added some tiny droplets of glossy accents to give due drops effect. Hope you can see it in the photos. Finally accents with silver sequins from Pretty Pink Posh. Now I cannot wait to watch Kathy video for day #3. 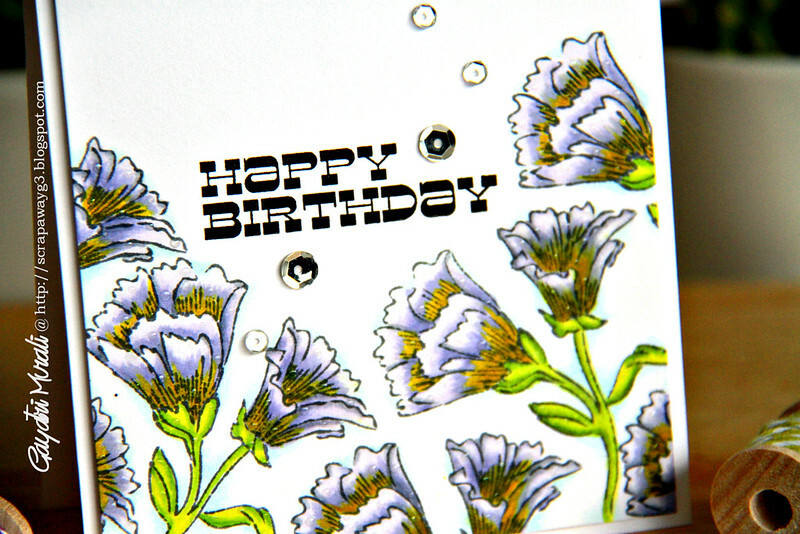 Gorgeous card, Gayatri. Love the coloring. love you coloring technique…I'm really agree, color is really relaxing maybe because you feel your breath in sinthony with colors or maybe because we come back children….